Tiffany's Online Finds and Deals: USB Rechargeable Electric Women Shaver 5 in 1 Grooming Kit ONLY $10.80! REG $26.99! USB Rechargeable Electric Women Shaver 5 in 1 Grooming Kit ONLY $10.80! REG $26.99! 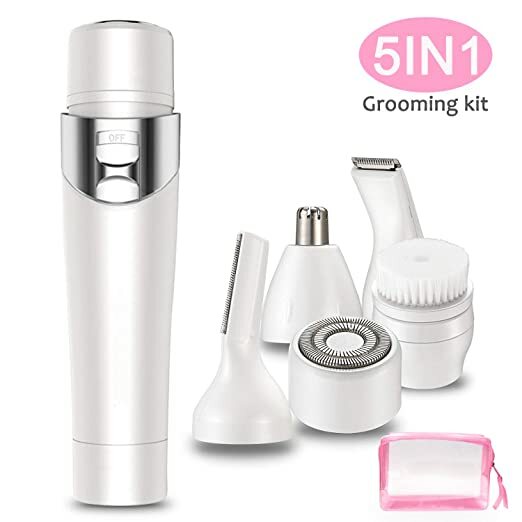 ★ 5 in 1 Lady Facial Shaver - CHYU 5 in 1 Face Grooming kits delivers 5 amazing ladies grooming tools in 1 awesome device for the modern woman on the go. All you need is include - electric trimmer, upper arm & leg shaver, nose hair trimmer, eyebrow trimmer and cleaning brush. Right this facial hair removal kit in the palm of your hand,Make you confidence and outstanding at anytime. ★ Removes All Your Unwanted Tiny Hairs - Beauty you face in Painless and Flawless. CHYU lady facial hair removal is is designed to use on upper and lower lip, cheeks, chin and neck, dial in those eyebrows, clean up the nose area,good at removing peach fuzz and leaves it smooth so Make-up Glides-On impeccably. Say goodbye to painful wax and quickly shape up your bikini line for fun in the sun! ★ Waterproof & Easy to Clean - Convenient for wet and dry use. Functional, waterproof attachment design makes it simple, safe and easy to change out the heads for whatever you need. Painless hair remover Works with the anti-allergic stainless blades hidden in cutter head.All heads are washable but you'll want to avoid water contact with the electronic components to ensure long-term use. ★ Get A Hair Removal kit Suitable for Everyday Use - This Painless Hair Removal Set Portable enough to put it in your handbag,and this USB Rechargeable Hair Remover allows you trimming when you are in worldwide travel and use it instantly. And the sound is lower than 40db, so you can style confidently while your families are sleeping. ★ Lifetime Warranty Guarantee - Enjoy this Painless and Flawless Electric Hair Trimmer wherever you go. If for any reason you are unhappy or experience issues with your device, you’ re always covered under CHYU premium Lifetime Warranty. Simply contact us for a guaranteed replacement.